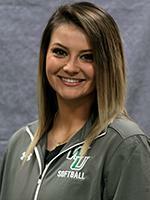 BENSALEM, Pa. - - Runs were a plenty for the Wilmington University softball team as they swept a Central Atlantic Collegiate Conference doubleheader, 14-0 and 17-0, in a pair of five-inning games at Ben Salem High School Field on Wednesday. It was a record game for Wildcat (15-8, 3-1 CACC) sophomore third baseman Lauren Lopez, as she broke the program’s single game mark with eight RBI in the contest. She batted 4-for-4 with two doubles, bringing in eight runners to break the mark set by six different Wildcats with six RBI in a game. Lopez started the scoring in the top of the first inning with runners on second and third. Lopez lined a single into left field, easily scoring Rosa’Lynn Burton (Caesar Rodney) from third while Kiana Broderson-Jones came in on an error in the outfield. Lopez was at it again in the top of the second inning, coming to bat with the bases loaded and one out. Lopez singled into left again to bring in Jazmeen Llamas and Courtney Dellinger for RBIs while Broderson-Jones scored on another error in the outfield. The sophomore capped the scoring in the top of the fifth inning as well, again coming to bat with the bases loaded and one out. This time Lopez doubled to center field, clearing the bases for all three RBI and giving the Wildcats a 14-0 lead. Caitlyn Whiteside went all five innings for the win, improving to 9-6 on the season. She allowed two hits while striking out six and only walking one batter. Aside from Lopez, Alyssa Velasquez batted 3-for-4 with a double and a triple, knocking in one RBI. Jazmeen Llamas went 3-for-3 with an RBI while Rosa’Lynn Burton went 2-for-4 with three runs scored. The hit parade continued in game two for the Wildcats, as they had 17 more hits and 15 more RBI. The Wildcats scored three in the top of the first, seven in the top of the second, and six more in the top of the third to jump out to a 16-0 lead. Alyssa Velasquez had an RBI double in the first and Makayla McCarthy hit an RBI single to right field to get things started. Lauren Lopez collected another RBI single in the second before Angela Antonini brought in Kiana Broderson-Jones with a bunt single. Makayla McCarthy had another two-run single before Alexis Sann made it 10-0 with a two-run double. Kiana Broderson-Jones led off the top of the third with an inside the park home run and two batters later Angela Antonini cleared the fence with a two-run shot to left. Lexi Baughman (St Georges) got in on the scoring with an RBI double and the Wildcats led 16-0 after three full. Broderson-Jones capped the runs with an RBI single to center in the top of the fifth. Makayla McCarthy had a no-hitter going into the fifth inning, but the Tigers ended it with one out in the frame. McCarthy went five innings with five strikeouts, allowing two walks. Velasquez went 3-for-3 with a double while Burton, Broderson-Jones, Lopez, Antonini, and McCarthy all ended with two hits. Broderson-Jones, Antonini, and McCarthy led the way with three RBI each. The Wildcats take their four-game winning streak to Bloomfield on Saturday, continuing with CACC competition. The first pitch on Saturday is scheduled for 12:00 p.m.